We had some great weather and incredible springtime views for Stowe’s last lift-served day of the season. 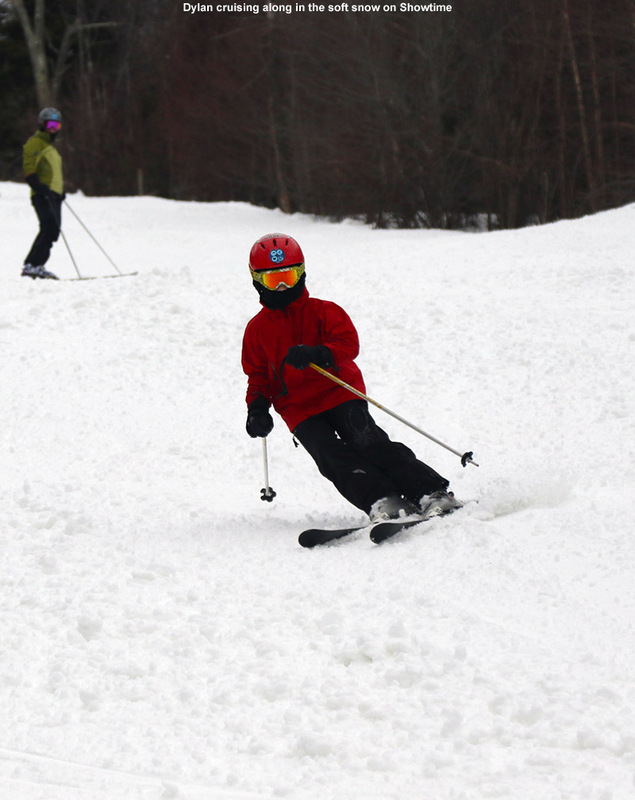 Today was probably 20 degrees cooler than last Sunday, but it was still looking warm enough to offer some spring snow for Stowe’s final lift-served ski day of the season. 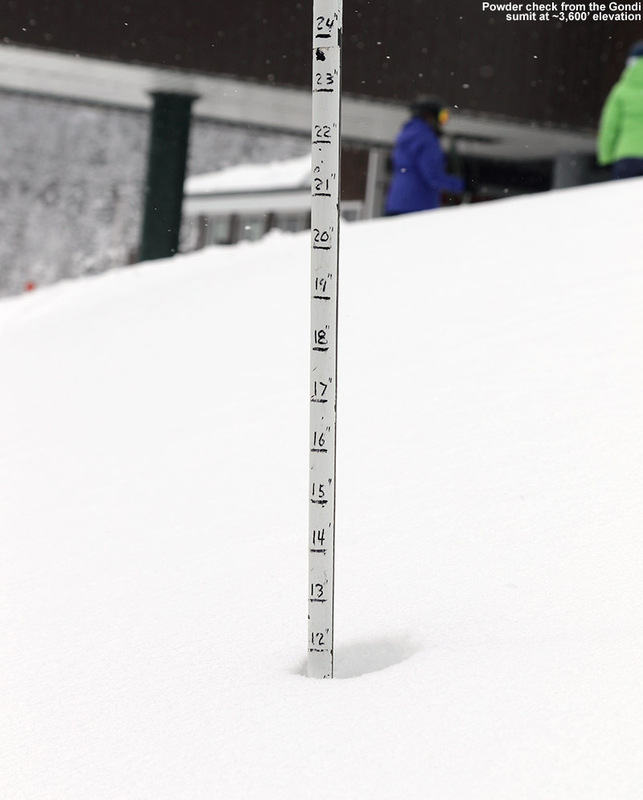 We headed to the mountain in the mid-afternoon timeframe and found that the tail-gaiters were out again in full force in the Mansfield Parking Lot like last week. There was even a band playing off the deck of the Mountain Operations building. E forgot her coat, which had her pass in it, but she decided to just hang out in the car and get some work done since the boys and I only planned to do a few runs. As Ty, Dylan and I rode the Fourrunner Quad, we could see that shaded locations on the upper mountain were really holding winter-like snow – or in this case icy frozen granular since we’ve had many a freeze-thaw cycle by this point. The air temperature was just a bit above the freezing mark at the top of the Fourrunner Quad, but with the strong April sun, only fully shaded areas were of any concern with respect to being to firm to hold a good edge. 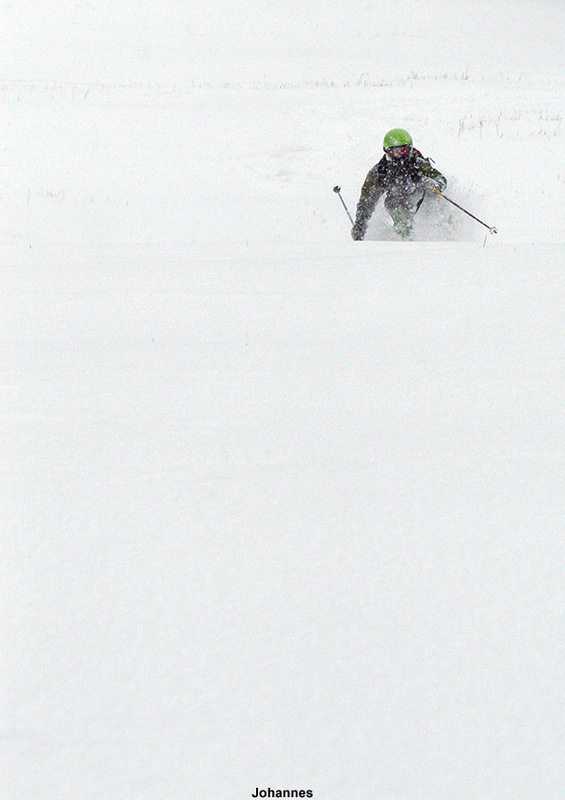 Everything else was soft corn snow like you’d expect to find in late April. 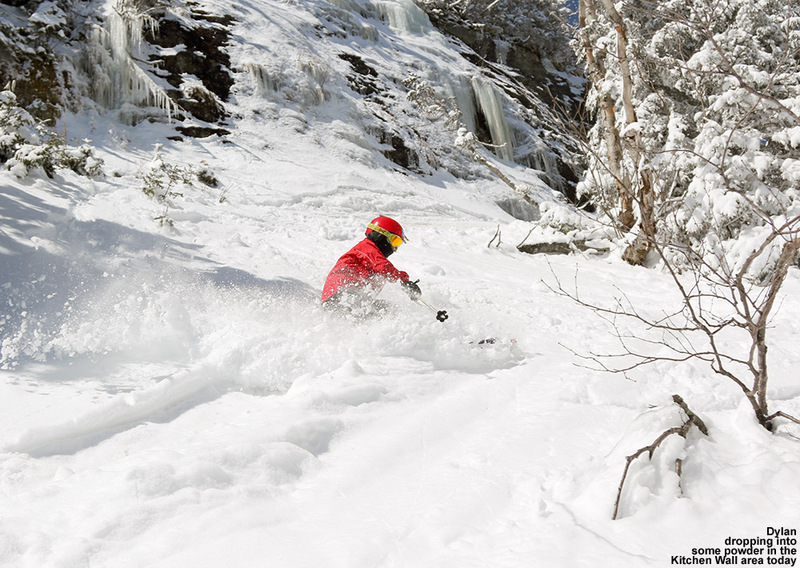 We took a trip down Nosedive and found coverage to be in great shape – there should be plenty of earned turns there well into May as usual. I’d say the same is generally true for the typical Lord/North Slope route as well. 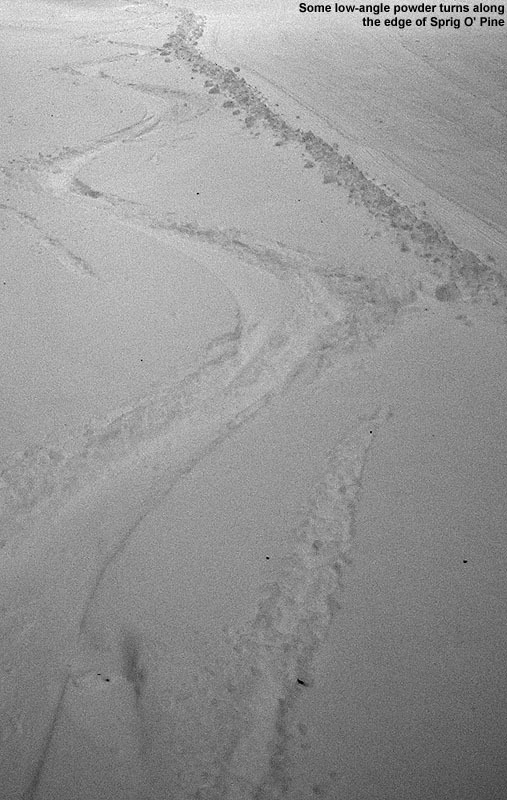 On our last run, the boys ski technique really degraded… on purpose as it turned out. They had loads of fun goofing around with poor technique and were incredibly impressed with how much more work it took to ski that way – especially in areas of soft snow. 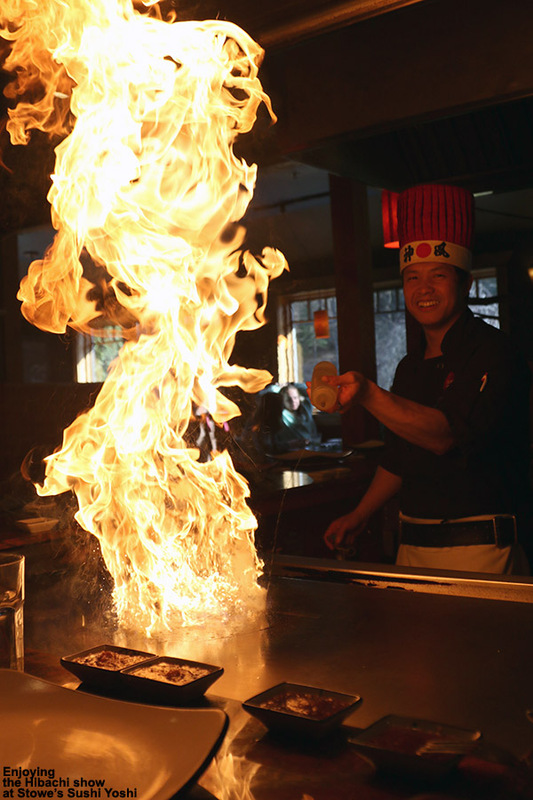 It was a nice way to close out the lift-served season on Mansfield, and we topped it off with an après ski stop at Sushi Yoshi. 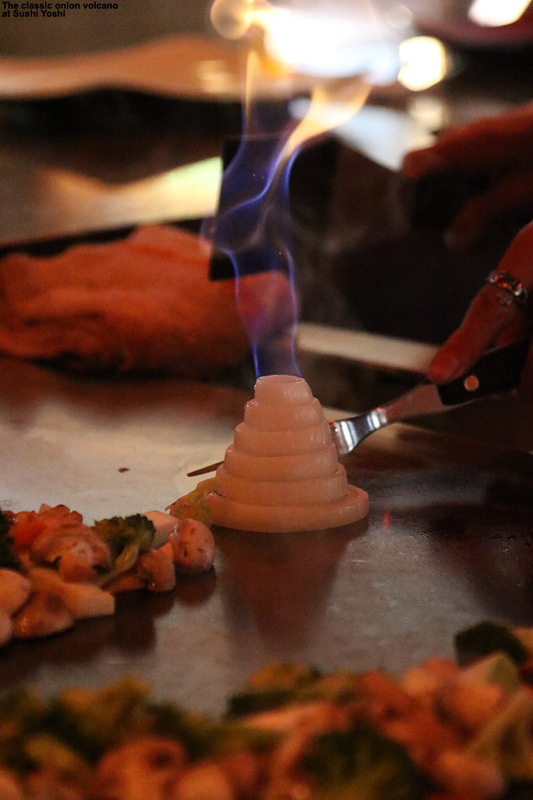 We had time to go for some hibachi, which was a good show as always! We’ve actually got some cooler weather coming into the area this week with a chance for a bit of snow in the mountains over the next couple of days. 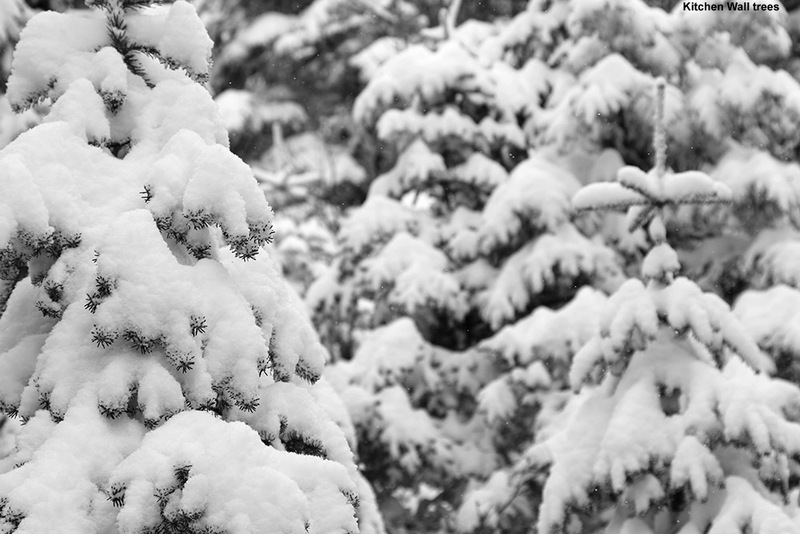 It should be fun to see exactly what happens with respect to snow, as it’s always an interesting piece of weather if it falls in any of the lower elevations when we get close to May. 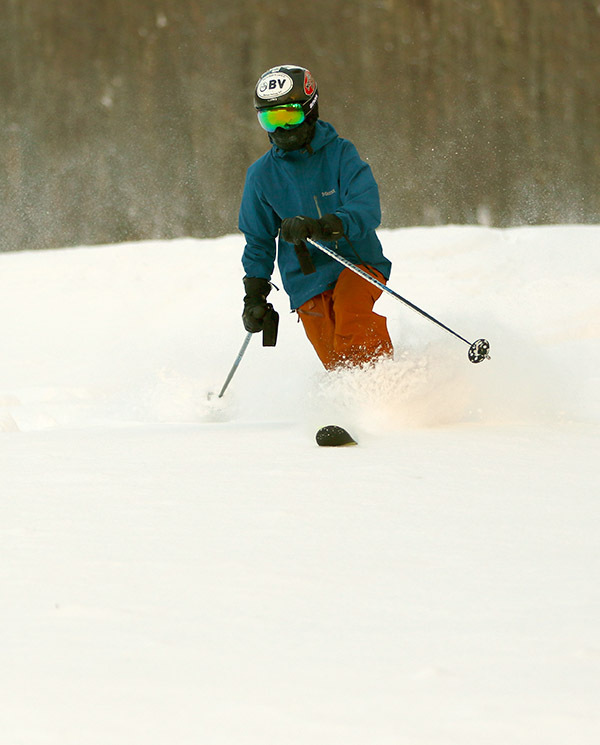 The family out for one of Stowe’s final days of lift-served skiing this season! 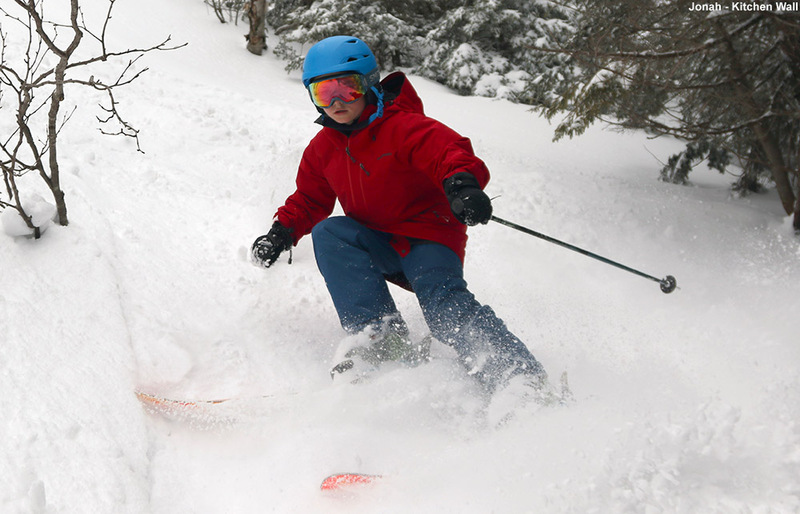 The nice forecasts had been out there for a while, and folks knew that we had a fantastic weekend of weather on the way – one that would bring back the spring skiing after our winter-like interlude over that past couple of weeks. 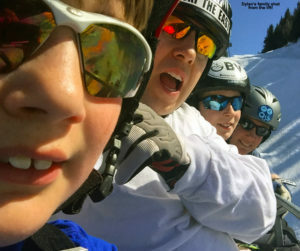 I was pretty busy with work in general since we’re near the end of the spring semester, but the whole family took some time this afternoon to catch a few runs at Stowe and enjoy the spring snow. Temperatures were in the 60s F even at the mountain, so all the snow was well corned up, and of course the usual tail-gaiters were out in force in the Mansfield Parking Lot. The Fourrunner Quad is the only option for lift-service now, so we spent our time there with a couple of great trips down the bumps of Centerline to really get that spring groove going. One of the big highlights of the day was Dylan getting down in the corn snow so that he could be intentionally whitewashed – and of course the rest of the family all took advantage of that opportunity. Dylan just loved it, probably because he was overheating with the warm weather, which would be typical for the boy who’d be happy to wear shorts all year round if we’d let him. 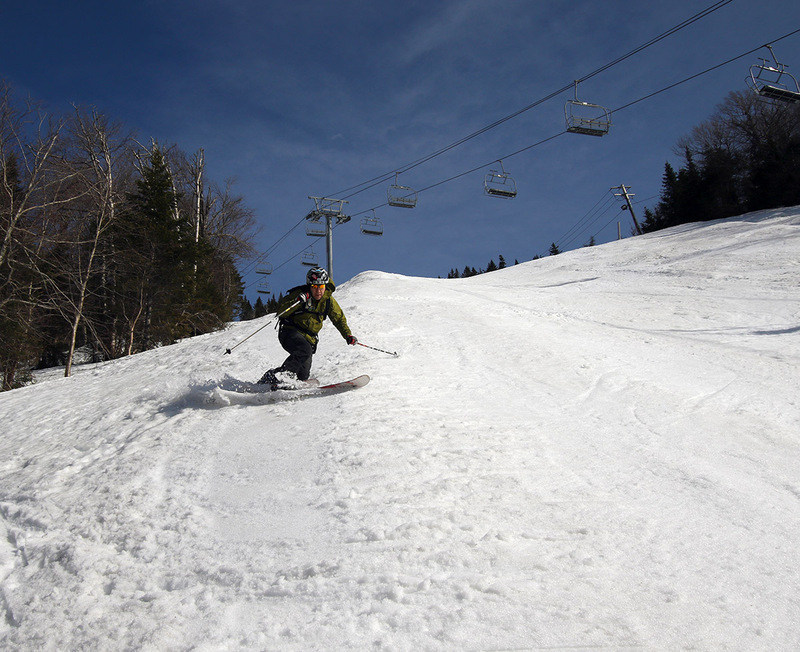 That’s it for the lift-served season at Stowe, but there’s plenty of snow left on the trails, so hopefully we’ll have a chance to get out for some skinning if the weather cooperates. From what I can see it’s going to get a bit more active with respect to precipitation, but it looks like we’ll generally be seeing warm days and cool nights to keep the corn harvest in full swing. 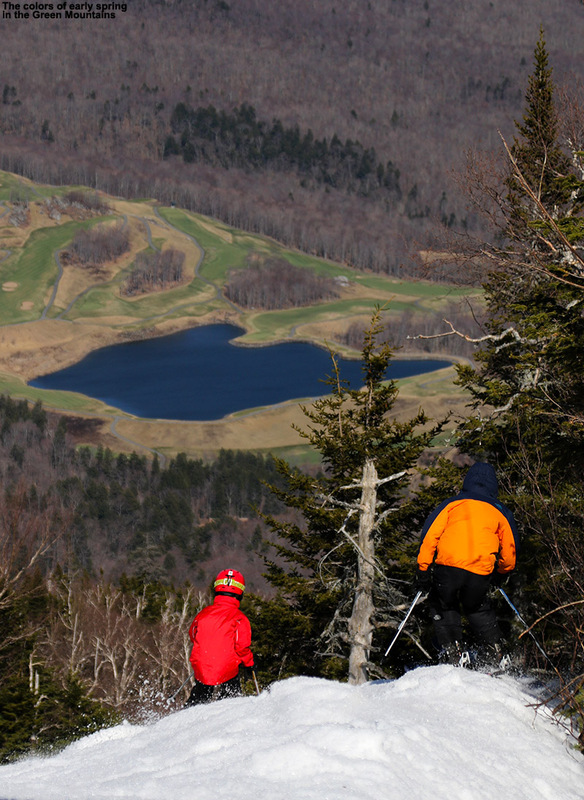 Although the lowest elevations were softening in the April sun, Stowe’s terrain in the upper elevations of Mt. 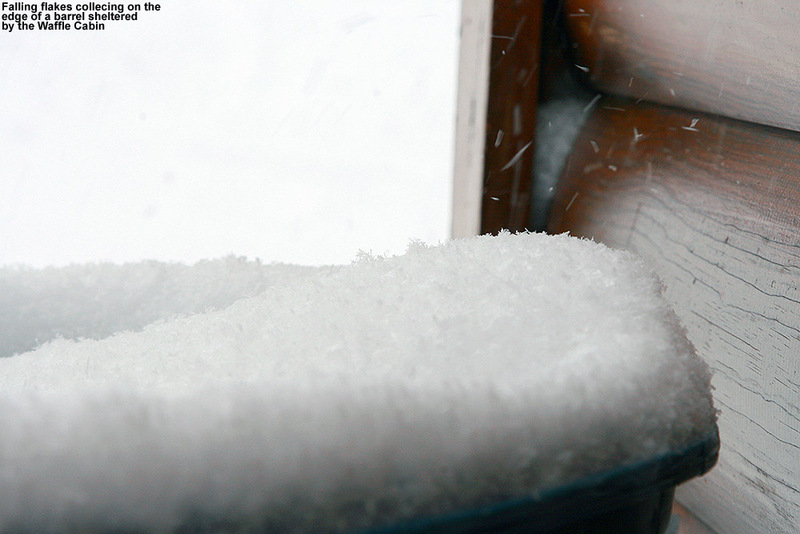 Mansfield appeared to hold onto winter snow all through the day yesterday. That got me thinking about taking a couple more runs in the powder today, and although Ty was a bit under the weather and E planned to stay home with him, Dylan was happy to go with me to see what we could find. 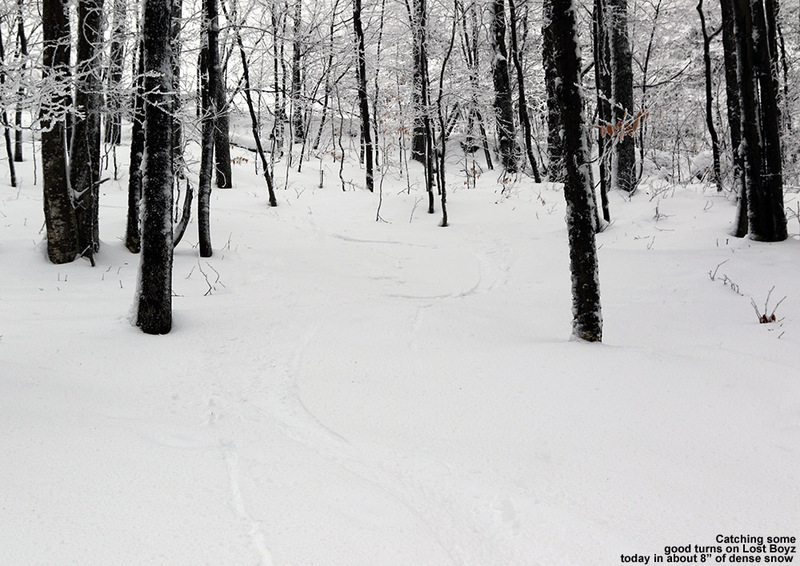 We couldn’t get out early, but we were able to head out to the mountain around midday. Even in the valleys, temperatures were holding at or below freezing despite lots of April sun, so we knew that at least the air temperature wasn’t going to be affecting the snow. Today was even sunnier than yesterday, and the high peaks like Mt. Mansfield were standing out brilliantly above the lower elevations. 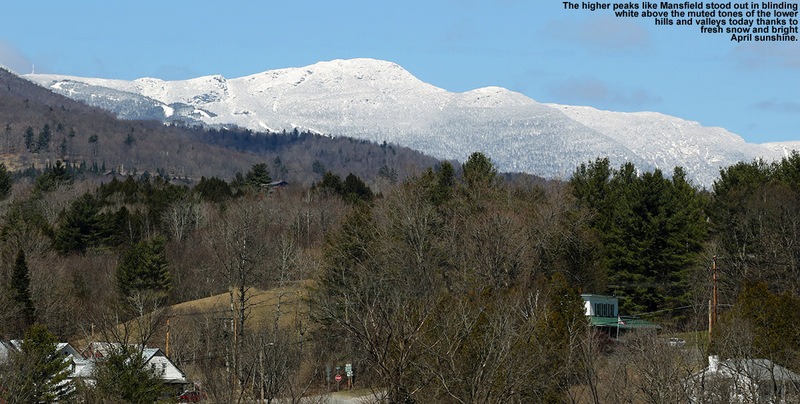 It was quite a sight to behold as we traveled along Route 100 east of the Green Mountain Spine. Dylan and I followed my procedure from yesterday, parking in the Midway Lot and heading right up the Gondola. Since I knew coverage was fine in the Kitchen Wall area, we headed right there to see how the powder was faring in the highest lift-served elevations. I hadn’t actually taken the main Kitchen Wall Traverse yesterday, but I have to say it was one of the most challenging trips I’ve had through there. The snow pack is just that bit on the low side that keeps some extra stumps sticking out in a few places, so you really have to keep your eyes open for the best routes to use. We were quickly able to tell that even up in those elevations, any snow in direct sunshine was turning mushy, so we picked a partially shaded line for Dylan and he dropped into one of the snowfields. He had some nice turns, but as we got down lower, even though we were predominantly in the trees, we encountered a lot of challenging, sticky snow wherever light was sneaking into the forest. Down in the Nosedive Glades we generally stuck to the main routes to avoid that type of snow, but we found plenty of good turns on lightly tracked or skier packed snow. We finished off with Nosedive, which had conditions similar to yesterday, with the snow quality being better the higher you were in elevation. We knew the window for ample off piste skiing was just about closed with the way the powder was getting sticky, so we decided to stick with an on piste run down Gondolier. 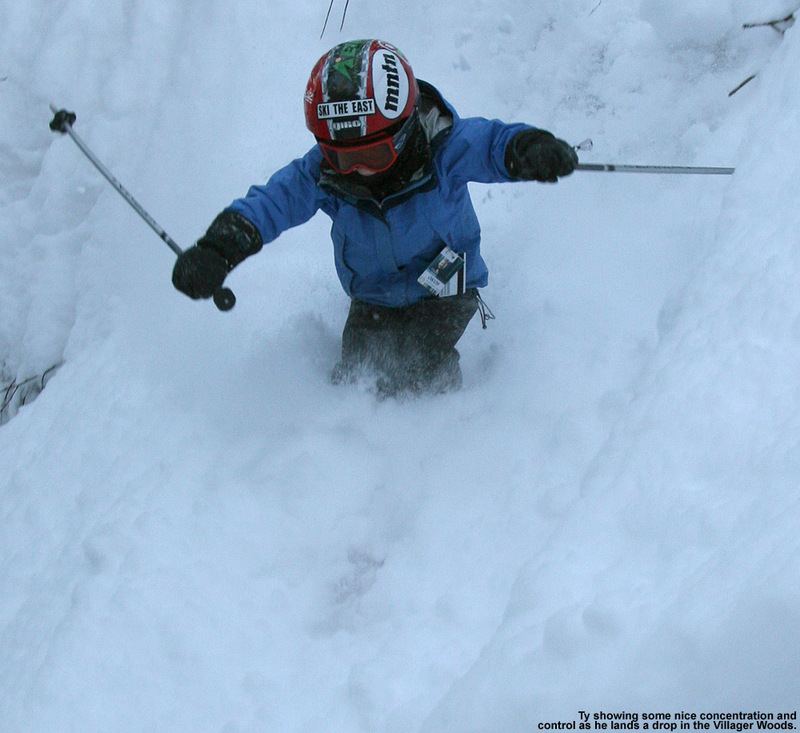 We debated going to Cliff Trail, but Dylan said we would be too tempted to head off piste and we’d end up paying for it if we got into mushy snow. We still managed to get sucked off piste below the switchback of Perry Merrill, and that was our most exciting adventure of the day. 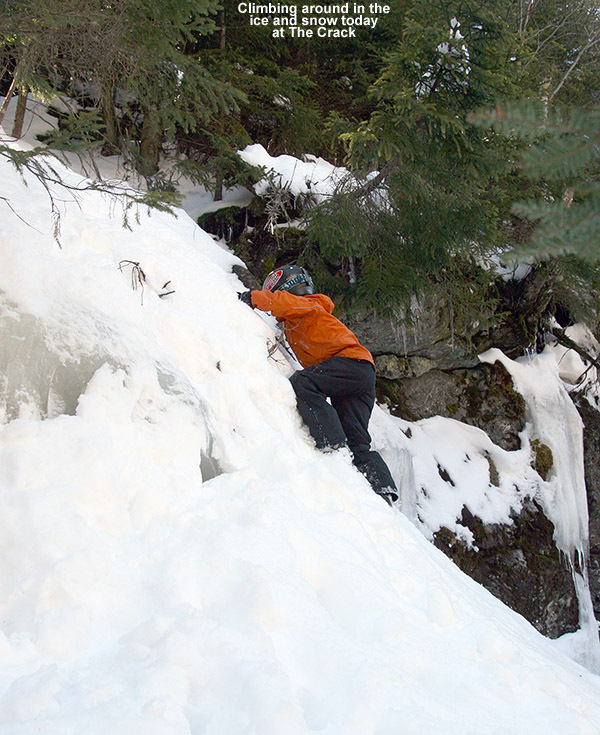 The snow was actually pretty well preserved because of the shady nature of the area, and we came upon a nice cliff band with an ice fall that will no doubt be a lot of fun when we have ample midwinter powder. 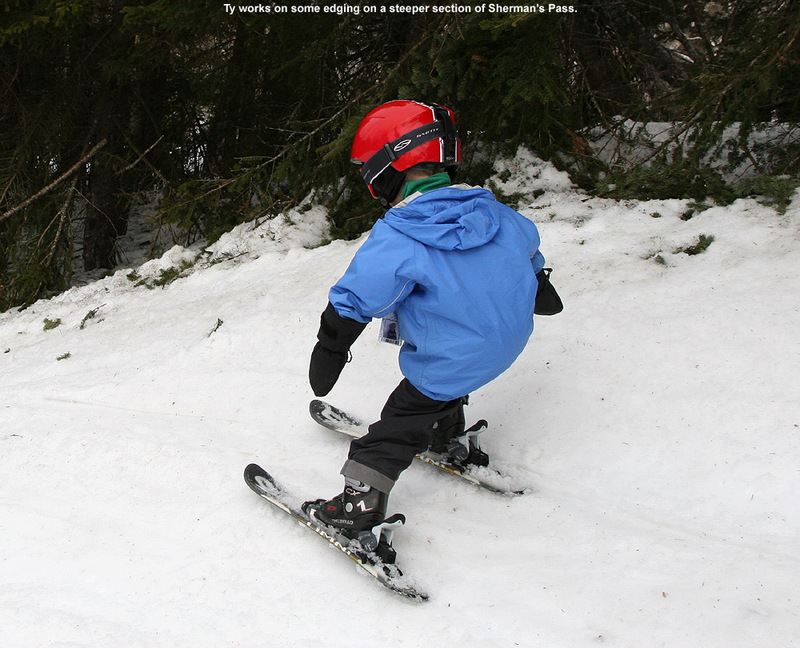 Dylan and I were already planning to take our BJAMS ski group to the area next season. 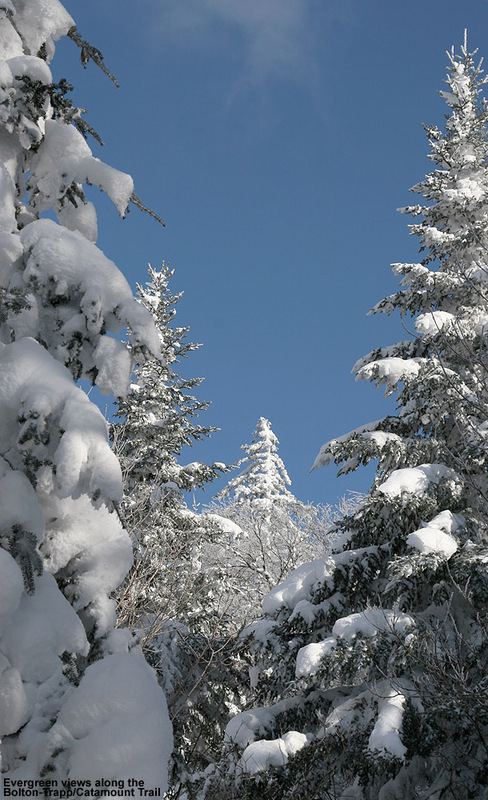 We had to sift our way through some denser evergreen areas to get back to Perry Merrill, but our navigation was good and we quickly got back on piste. We ran that run out with a combination of Perry Merrill and Gondolier, and that was enough to consider ourselves satiated for the day. We did get into a bit of corn snow near the bottom of Gondolier, and Dylan commented on how that was his favorite snow on the trail, so he’s definitely ready for full on spring conditions vs. the transitionary snow that appears on some of these spring days. 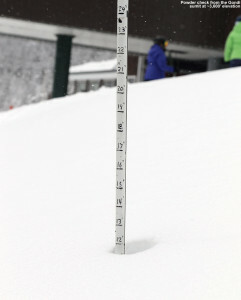 A quick depth check at the top of Stowe’s Gondola today revealed a foot of midwinter powder. Over the past three weeks we’ve had a couple of March snowstorms that produced some moderate powder days, and another April one ahead of our most resent storm cycle, but there wasn’t anything that fell on the weekend or was quite big enough to get me out for early morning turns. That’s just sort of the way it’s been this season, but yesterday evening the Northern Greens did a bit of their more typical convening with Mother Nature and snow began to dump along the spine as moisture smacked into the mountains on a westerly flow. 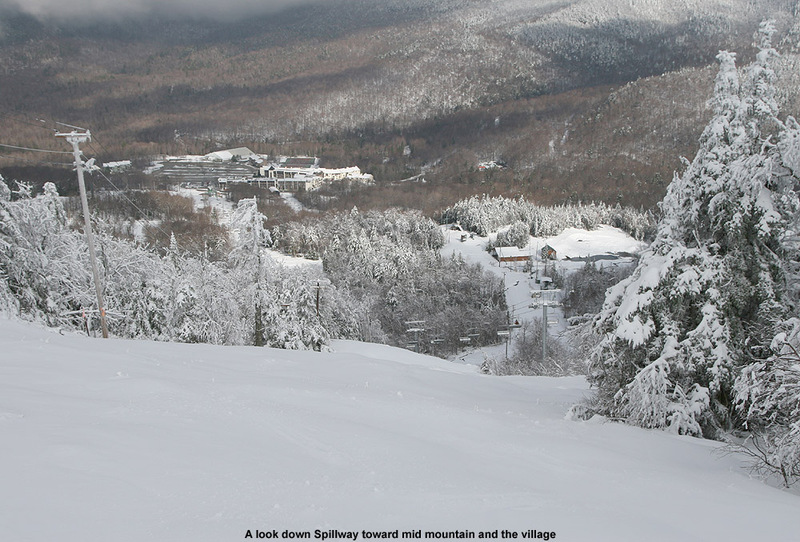 We had some decent bouts of snowfall here at the house, and being a Friday night, it was definitely enough to get me thinking about a trip to Stowe. 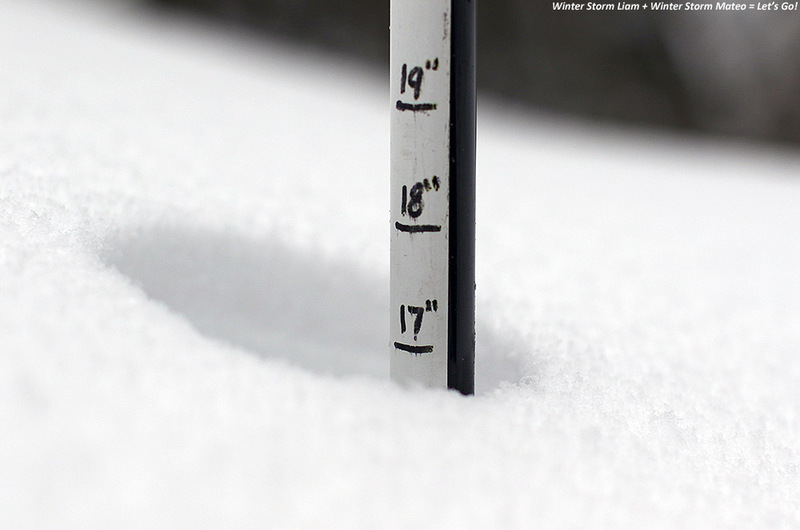 By morning, totals for the full storm cycle were hitting 12 to 18 inches at the northern resorts, so after catching up on a few things at the house, I headed off for some turns around mid-morning. 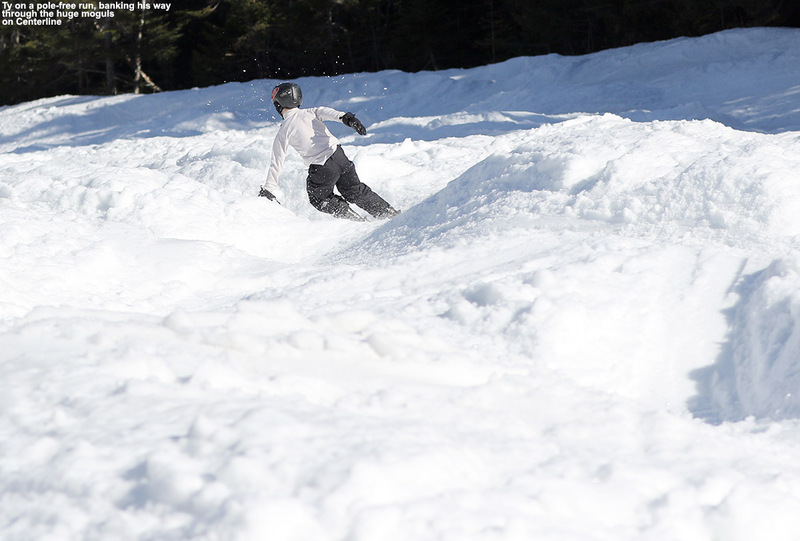 Temperatures were still at or below the freezing mark at all elevations, but the new snow was already starting to melt off in the valleys thanks to the strong April sun. 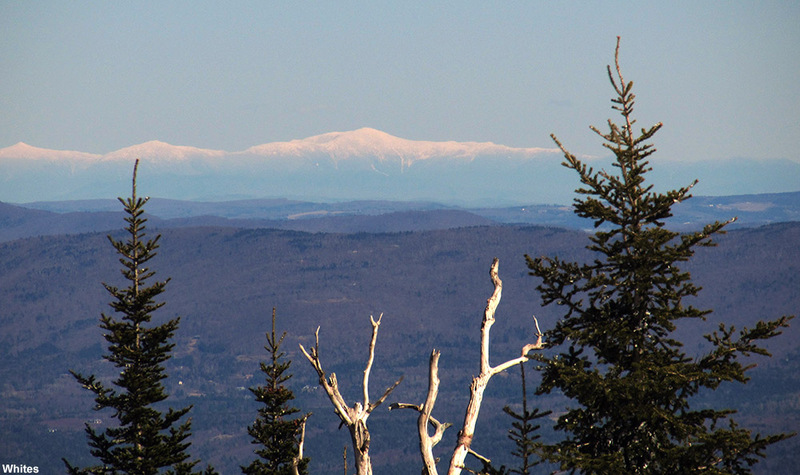 The mountains were holding their own with respect to the snow however, and I headed right to the Midway Lot and up the Gondola to see what Mansfield had delivered below The Chin. 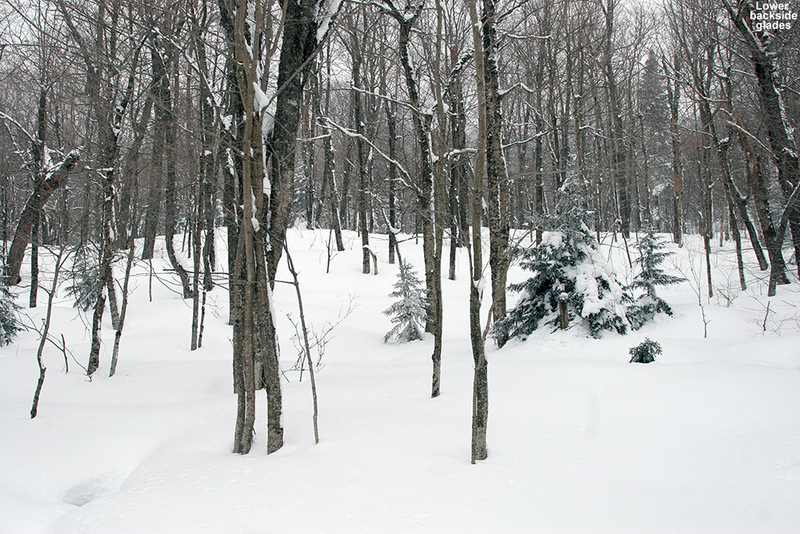 Indeed Mansfield had done its usual business, and a quick probe in untouched snow outside the Cliff House as I put on my skis revealed a nice foot of midwinter powder. 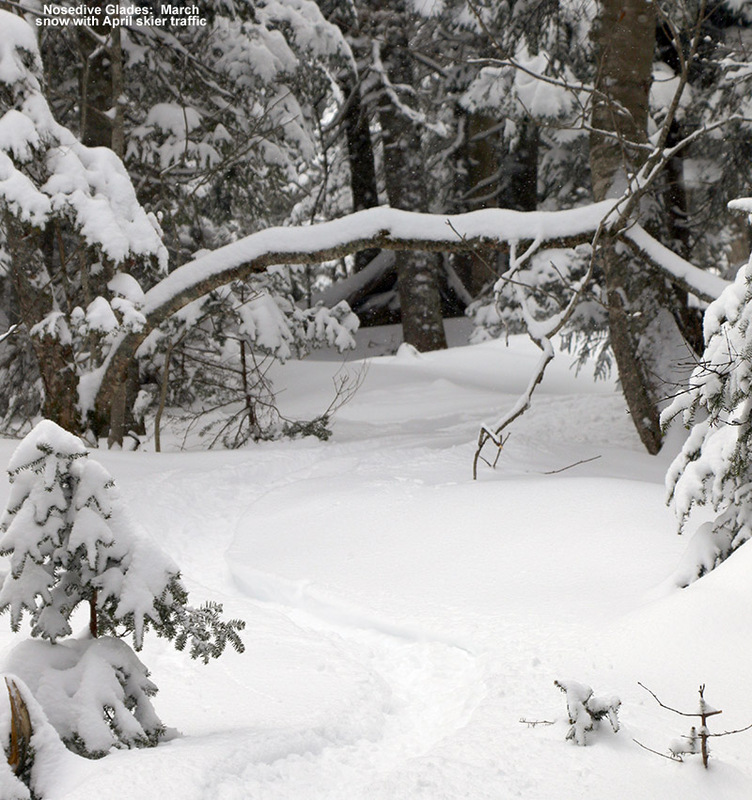 I took a first run down Gondolier, and encountered some simply amazing snow along the edges of the trail. The powder petered out to just a few inches in depth by the time I was back down to the Gondola base, but there had been a pretty solid resurfacing on the upper half of the mountain, and it was only the lowest ¼ of terrain that left much to be desired in terms of hitting the old base. I wasn’t yet sure what I was going to explore with respect to off piste adventures, but back in the Gondola I rode up with a couple that had been in the Nosedive Glades, and another gentleman who had just visited the Kitchen Wall, and it all sounded quite good. 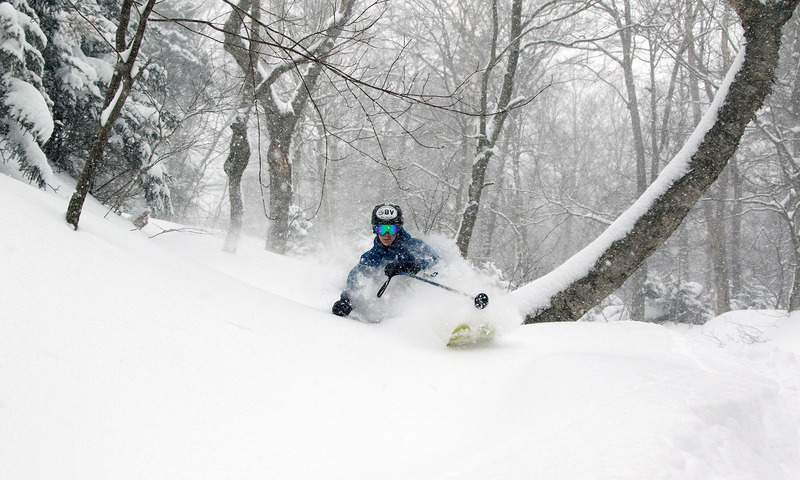 Based on the accumulations I’d seen, I didn’t have to second guess any of it and headed right off to the Nosedive Glades from the north. 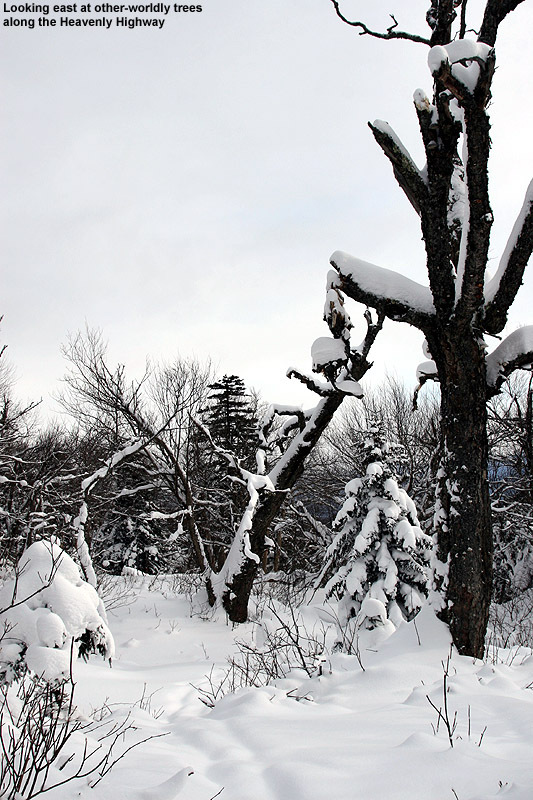 As I headed along the Glades Traverse the realization hit me that we were indeed dealing with April-style visitation numbers at the resort – there was just untracked entry after untracked entry into the glades. Eventually I just had to choose one and I dropped in. The powder was great, with just a little hint of getting thick due to temperatures and sun, with the effect increasing a bit as you lost elevation. I knew that higher would be even better, so I visited the Kitchen Wall area next, and found a solid 10 to 14 inches everywhere I checked. 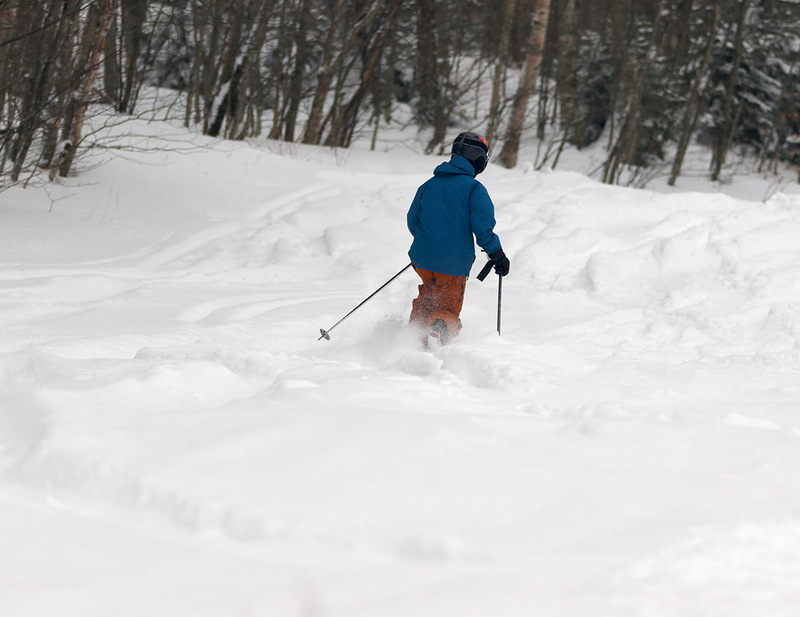 Even at midday it wasn’t hard to find untracked lines in even the most common glades today thanks to the lower number of resort visitors this late in the season. I went with my Telemark skis today because I wanted to really blast my legs after not skiing for a stretch, and my only regret would be that I was just burning too quickly each run after being off the boards for too long. I’d have to stop and rest them often, but I can’t say it was really all that bad just hanging out in the warm spring sun. 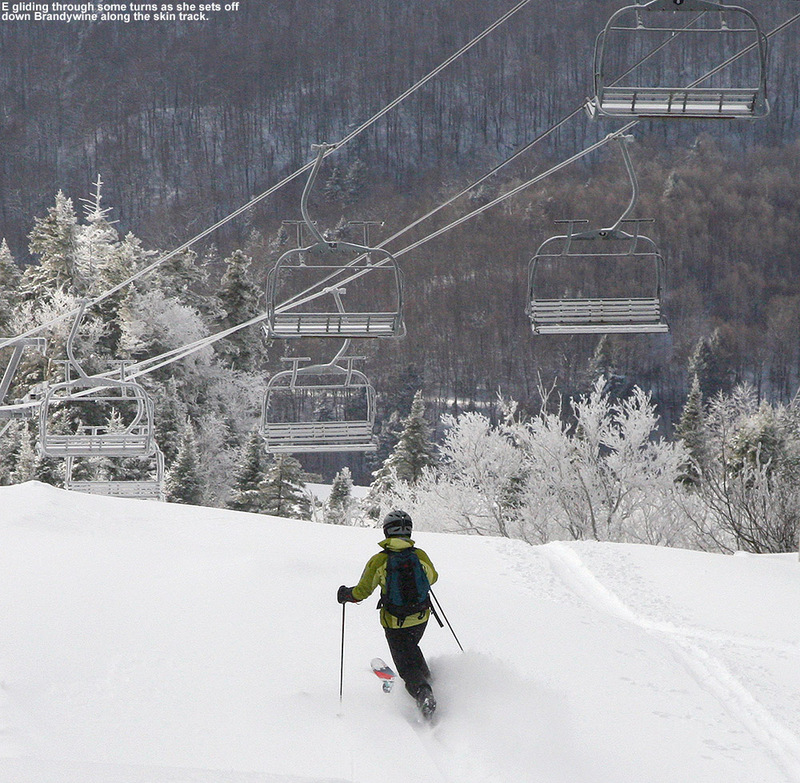 A few runs on that Mansfield vertical serviced by high-speed lifts was enough to totally cook my legs, but at least my body got the workout it needed. Hopefully we won’t have to deal with such a period of generally horrible conditions as we’ve seen the past few weeks for quite a while – I can already tell that I’m going to pay for today’s workout and it’s only been a few hours since I finished!